The sin narratives of Genesis 3 and 4 have been scrutinized by biblical interpreters throughout the centuries. Some exegetical traditions have separated the story of Cain-Abel from the preceding Edenic narrative, thus undermining the unity of the Primeval History. The book synthesizes the sin narratives of Adam-Eve and Cain-Abel and examines a wide range of premodern biblical interpretations attesting to their literary and theological unity. This study makes a case for reading these primordial narratives as one familial saga that conveys to the reader the origins of human defiance against God. ""By tracing the early history of the interpretation of the sin narratives of Adam-Eve and Cain-Abel, Igal German offers a valuable resource not only for biblical studies but also for historical theology(specifically the 'fall' and 'original sin').And by having the rare insight to include Genesis 4 in his exegetical and historical analysis, Dr. German cracks a door open for pondering how differently the likes of St. Paul and St. Augustine might have articulated the doctrine of sin.For biblical studies, Igal helps round out the primeval notion of sin in Genesis 3 and 4, whereas for theologians and historians of early biblical exegesis, he offers a helpful and fascinating overview of how the stories of defiance against God in Eden and outside of itwere understood at an early time of profound influence."" --J. GLEN TAYLOR, Associate Professor of Old Testament, Wycliffe College and the School of Graduate Studies, University of Toronto ""In this provocative study, Dr. Igal Germanoffers a new take on the literary unity of Genesis 2-4. Standing apart from many other treatments of Genesis, this work delves deeply and expertly into early Jewish interpretation to offer new possibilities for reading these key chapters. Igal has done a fine job of collecting and analysing many often overlooked sources in the history of interpretation to press his case. 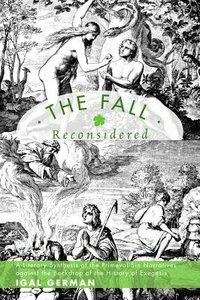 Those interested in the history of interpretation of Genesis will find here a treasure trove of Second Temple Jewish, Early Church, and Reformation sources on the narratives of Adam-Eve and Cain-Abel."" --BRIAN P. IRWIN, Associate Professor of Old Testament/Hebrew Scripture, Knox College, Toronto School of Theology, University of Toronto ""Igal German's narratival study of the sin narratives of Genesis 3 and 4 paves the way for a greater appreciation of the literary and theological unity of the Primordial History. Igal's careful analysis of the Jewish and Christian histories of interpretation coupled with his insights into the rhetorical dynamics of the narratives of Adam-Eve and Cain-Abel coalesce into a work with which scholars must interact for years to come."" --BRIAN PETERSON, Author, Assistant Professor of Old Testament, Lee University Igal German (PhD, Wycliffe College, University of Toronto) teaches biblical studies at Spertus Institute for Jewish Learning and Leadership and at eTeacher: Biblical Online Language Academy."